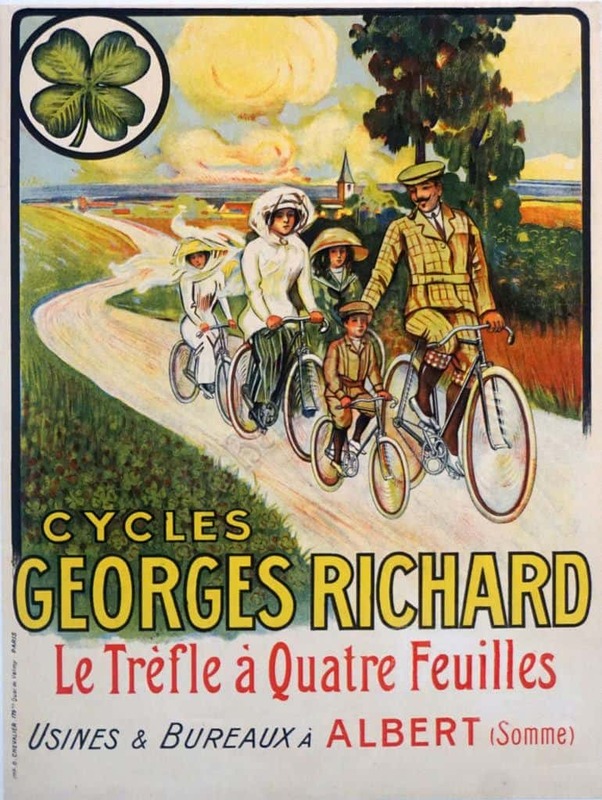 This is a French Belle Epoque period advertising poster for Georges Richard bicycles. The exquisitely made lithograph features a happy, dapperly dressed family riding bicycles down a winding road in a picturesque country scene. Below this detailed and lifelike image is bold yellow block typography reading “Cycles Georges Richard”, and below that again, red and black typography reading “Le Trèfle à Quatre Feuilles, Usines & Bureaux à Albert (Somme).” The use of realistic details and bright colors in the image, coupled with bold typography creates a classically Belle Epoque period advertising poster. This lithograph was printed by Imp G. Chevalier 179 dis Quai de Valmy, Paris 1890s.